Assists with regeneration, excellent for acne prone skin. These peels are mild but very effective, with visible results as early as the first treatment. The benefits range from cellular renewal, reducing signs of aging, sun damaged skin, scarring and discoloration. To achieve dramatic improvement in the skin’s appearance a series of treatments is recommended. Exfoliate without scrubbing to reveal brighter skin. 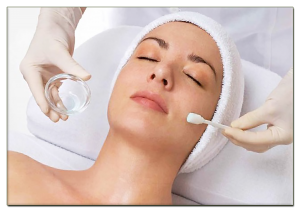 A light glycolic peel can be performed every weekend and is a great add-on to facials. The gentlest chemical peel. It is extra gentle and good for even the most sensitive skin. Target pigment, fine lines, and acne with a Jesners peel. We can perform light to deep peels depending on your desired results. Target acnaic prone skin by treating the bacteria that causes acne.